This city, the Mexico Capital (Distrito Federal), is the world'slargest metropolis. Mexico's best and worst ingredients are all here: music and noise, brown air and green parks, colonial palaces and skyscrapers, world-renowned museums and ever-spreading slums. One moment the city is all Latin beats, glamour and excitement; the next it's drabness, poverty, suffocating crowds and rancid smells. In spite of the negatives, Mexico City is a magnet for Mexicans and visitors alike. 10,000 BC: people and animals lived around Lago de Texcoco, the lake that then covered much of the floor of the Valle de México. After 7500 BC the lake began to shrink, hunting became more difficult, and the inhabitants turned to agriculture. A federation of villages evolved around the lake by 200 BC, but the biggest one, Cuicuilco, was destroyed by a volcanic eruption that occurred around 100 AD. Teotihuacán, 25km (16mi) northeast of the lake was the next major influence in the area. For centuries Teotihuacán was the capital of an empire stretching to Guatemala and beyond, but it fell in the 7th century. The Toltec empire, based at Tula, 65km (40mi) north of modern Mexico City, was the most important of several city-states in the region in the following centuries.By the 13th century the Tula empirehad fallen too, leaving a number of small statelets around the lake to spat over the Valle de México. Aztecs emerged as the winners. 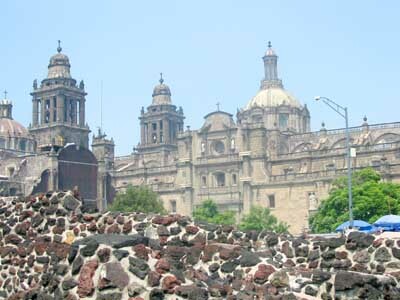 Wrecked during and after the Spanish conquest, the Aztec capital Tenochtitlán was rebuilt as a Spanish city. The native population of the Valle de México shrank drastically - to fewer than 100,000 within a century of the conquest, by some estimates. But the city itself emerged by 1550 as the prosperous and elegant, if insanitary, capital of Nueva España. Hospitals, schools, churches, palaces, parks and a university were built. Broad, straight streets were laid out and buildings constructed to Spanish designs with local materials such as tezontle, a light-red volcanic rock that the Aztecs had used for their temples. Lago de Texcoco often overflowed into the city, damaging buildings, bringing disease and forcing thousands of people away from their homes. Right up to the late 19th century the city suffered floods caused by the partial destruction in the 1520s of the Aztecs' canals. 1810: On October 30, some 80,000 independence rebels had Mexico city at their mercy after defeating Spanish loyalist forces at Las Cruces, just west of the capital. But leader Miguel Hidalgo decided against advancing on the city - a mistake that cost Mexico 11 more years of fighting before independence was achieved. Under the despotic Porfirio Díaz, who ruled Mexico for most of the period from 1877 to 1911 and attracted much foreign investment, Mexico City entered the modern age. He had railways built to the provinces and the USA. A drainage canal and tunnel dried up much of the Lago de Texcoco, allowing further expansion. Industry grew, and by 1910 the city had 471,000 inhabitants. 1911: After Díaz fell, the Mexican Revolution brought war and hunger to the city's streets. 1920: Diego Rivera, David Alfaro Siqueiros, José Clemente Orozco and other young artists were commissioned to decorate numerous public buildings with dramatic, large-scale murals conveying a new sense of Mexico's past and future. 1940: 1.7 million people lived in Mexico City, and factories and skyscrapers started shooting up left and right. Despite continued economic growth into the 1960s, political and social reform lagged behind. The supply of housing, jobs and services couldn't keep up with the growth, and shantytowns were born on the city's fringes. Student-led discontent came to a head as Mexico City prepared for the 1968 Olympic Games. Ten days before the games began, 5000 to 10,000 people gathering in Tlatelolco, north of the city centre, were encircled by troops and police. To this day, no one knows how many people died in the ensuing massacre, but the number is estimated to be in the several hundreds. 1970: Mexico City kept growing at a frightening rate and began to develop some of the world's worst traffic and pollution problems, only slightly alleviated when the metro system opened in 1969 and by attempts in the 1990s to limit traffic. Despite a devastating earthquake that killed over 10,000 people in 1985, people have continued to pour into the city. 1990: The poverty and overcrowding that always existed alongside the city's wealth were exacerbated by the recession, which left hordes of people living on marginal levels of basic subsistence. One effect of the crisis was a huge jump in crime. Subsequent recovery was very gradual. 1997: the D.F. was granted political autonomy, and elected its own mayor for the first time that year. The new administration was widely seen as honest and well-intentioned, and made the first serious efforts to combat police corruption, a major factor in high crime levels. Today an estimated 1100 newcomers arrive in the city daily. It has multiplied its area more than 10 times since 1940, but it's still one of the world's most crowded metropolitan areas. 2000: Andrés Manuel López Obrador, a member of the left-leaning PRD, was elected mayor. The PRD's overwhelming victory in the capital in 2003's mid-term elections boosted López Obrador's potential as a candidate for the national presidency in 2006. Capitalinos have generally approved of his populist initiatives, which include an ambitious makeover of the Centro Histórico.